The term “steel dumping” has been used a lot in the media recently. But what exactly is “steel dumping” and what are the effects of “steel dumping”? The term “dumping” is often used in the context of international trading. When foreign markets price and export their goods at a lower price than the domestic market. Therefore, steel dumping is the term used to describe foreign steel manufacturers selling steel to other countries at an equal or lower price than their steel mills can produce. The problem with with dumping and steel dumping in particular is that the foreign market will obtain a large market share and eliminate domestic competition. In the past the US has frequently implemented anti-dumping laws designed to prevent or stop foreign markets from flooding the domestic market. Anti-dumping laws use tariffs and subsidies to level the playing field in the market. The process of identifying whether or not “dumping” has been occurring in the US is relatively detailed. It begins with a complaint or inquiry to the Department of Commerce by a domestic company. The petitioners provide the initial pricing analysis regarding the dumping allegations. Often times this leads to assumptions in favor of the petitioner because it is difficult to assess the value of the commodity in foreign and domestic markets. This is The Department of Commerce then looks into the claims made and decide a less than fair value has occurred in a market. The International Trade Commission then assesses the amount of damages. Then anti-dumping duties are imposed on goods imported from the dumpers' country at a percentage rate calculated to counteract the dumping margin. Earlier this year, President Donald Trump signed an executive order preventing the dumping of excess steel into the US. This order is seemingly directed at China who is responsible for 46% of the entire worlds steel production. This order imposes tariffs ranging from 3.62-148% on certain steel alloys brought into the US. However, this order also also affects other countries such as Austria, Belgium, France, Germany, Italy, Japan, South Korea and Taiwan. When a country imposes anti-dumping laws on certain products or commodities it gives domestic produces a “home-field advantage”. 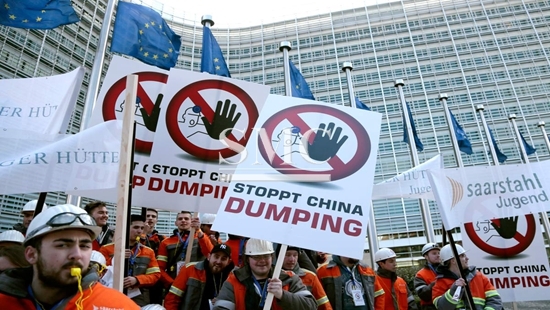 Anti-dumping laws preserve the domestic market share and profitability.